Well, just when I thought it was safe to go back into guitar stores, off I go again buying stuff ! I didn’t want a museum piece and would probably want to change things. 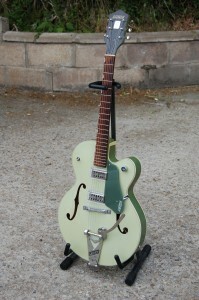 I’ve wanted a Gretsch semi, since I was 15. 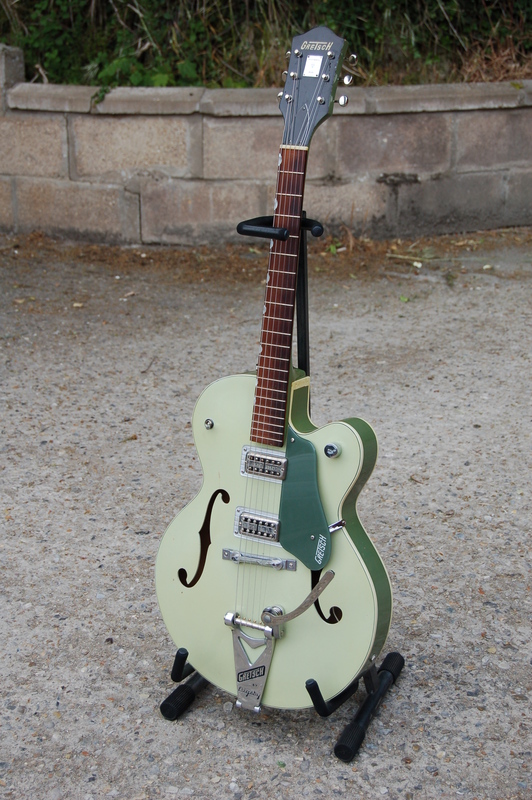 I wanted filter-tron pickups and a bigsby, which this had. I must confess I was worried about the colour before I saw it, it’s two-tone smoke green! However I think it looks amazing, the front is more off white really, with a hint of green, at least, that’s what I keep telling myself! The electrics are original, just a Volume pot on the bottom, I’m not a fan of multiple pots and switches being a Telecaster player. Even on that I NEVER use the tone pot so this is perfect. An extra pickup has been added at the back, converting it to a Double anniversary, this is a TV Jones filtertron, which I was prepared to change if necessary but have discovered it sounds great. It’s had a switch added, to change between pickups, and a Bigsby tremolo and bridge, which I wanted anyway. Whoever modified this guitar did a good job, the switch and pickup are in just the right place and really neatly routed and wired, much better than I could do, also the added switch, tremolo and pickup surrounds are all Gretsch originals, so it couldn’t have been better! I quickly discovered after a couple of gigs, that I can’t live with a floating bridge! I like the solid Bigsbys’, as I think they add tone, so I just drilled it carefully and screwed it down to the top. I spent ages checking the intonation and marking it out, I must have drunk 6 cups of coffee just procrastinating, but eventually I made the holes ! That one modification has made such a difference to this instrument, I’ve started playing it all the time, the black de-armond has been relegated to back up. The sound? It’s like all my favourite guitar tracks, overdriven it’s aggressive, like Who’s Next, or mellow, like Cortez the killer and clean it’s just 50’s country twang, it’s the most rock and roll guitar I’ve ever owned! The tuners are original basic open Grovers, which seem to work fine but I will probably change them, I’ll never sell this guitar anyhow. Not much else has changed really, the home made tube pre amp got really noisy so I bit the bullet and ordered a BK Butler Tube Driver, from the man himself in the USA. It’s an awesome device, I re-built my pedal board when I installed it, making a much neater job of it this time, using hard, solid core RF cable and replaced all the patch leads with right angle metal jack plugs. I used the Butler pedal for about 15 gigs, and then decided the overdrive sounded a little buzzy, so I tried a whole bunch of N.O.S. valves in there, different brands as well as different types and eventually replaced the original 12ax7 with a Mullard ECC82, which seems to have crunched things up nicely, the drive setting needs to be higher but the tone has definitely improved, (that’s why I use valve gear folks!). I recently acquired a Fender Custom Shop Blues Junior amp, which I’m using when Mark and I do Duo gigs, it’s a great amp and has now replaced the Gallien-Kreuger as my backup, ( At 18 watts it’s as loud as my tremolux!). And Finally, Mark and I have discovered K&K pickups and are now dedicated fans, I’ve got the Pure Western in my D18 now and the Trinity Western in my Martin 00016, which I use for solo gigs (I’ve just ordered a Trinity microphone to fit into the D18 too). These pickups sound great, really natural and the design is so sympathetic the guitars themselves seem to sound better even when they’re not plugged in! 0 comments By Mark on August 27th, 2008 @ 2:16 pm.